Enerkem is open to partnerships with industry leaders to implement facilities that utilize municipal solid waste to produce clean fuels and renewable chemicals. In addition to licensing its technology, Enerkem provides fully fabricated modular equipment and handles assembly on site. Several Enerkem biorefineries are now in development around the world, based on the company’s modular and standardized manufacturing approach. This includes a series of publicly announced projects in North America and Europe. Some of Enerkem’s current partnerships are summarized below. Enerkem’s facility in Varennes will produce biomethanol and cellulosic ethanol by converting non-recyclable residual materials from the institutional, commercial and industrial sectors, as well as construction and demolition debris. The future facility will take into account the best practices and learnings following the construction and operation of the world’s first commercial facility, Enerkem Alberta Biofuels, located in Edmonton, Alberta. The facility will be built in two phases. The first phase will allow the production and sale of biomethanol as soon as the facility is commissioned. The second phase will allow the conversion of biomethanol to cellulosic ethanol. Construction is scheduled to start late 2019. Air Liquide, Enerkem, Nouryon, the Port of Rotterdam and Shell are developing an advanced ‘waste to chemicals’ (W2C) plant in Rotterdam. The aim is that this will be the first plant of this type in Europe that make valuable chemicals and bio-fuels out of non-recyclable waste materials. The plant will be able to process 360,000 tonnes of waste into 220,000 tonnes or 270 million litres of sustainable methanol. This is more than the total annual waste from 700,000 households and reduces CO2 emissions by approximately 300,000 tonnes. The consortium has already undertaken extensive preparatory work, covering detailed engineering and the permitting process. It aims to take the final investment decision (FID) later in 2019 as it pursues the development work and finalizes the selection of an engineering and procurement contractor (EPC). For more information about the project, visit: https://w2c-rotterdam.com. 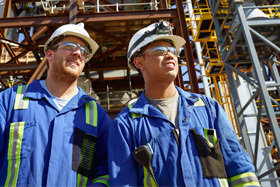 In 2018, Enerkem signed an agreement with Sinobioway Group worth over C$125M in the form of equity investment in Enerkem Inc., future licenses, equipment manufacturing and sales, as well as for the creation of a major joint venture to accelerate Enerkem’s global expansion and create a joint venture to build over 100 Enerkem state-of-the-art facilities in China by 2035.